On the day of the Star Festival. In the early morning when the sun still doesn’t let one experience the heat of summer, albeit having already risen, the town was already enveloped in the usual commotion for a festival as the people were bustling about. Even if it was still a while before the gates open, a stream of people were heading towards the south and east gates. I leave home together with Lutz who came to pick me up. Tuuli starts off together with us, but since it seems Tuuli is going to enjoy the festival with her friends, we will part ways. She runs off towards the gate, together with Ralph and Fey. Running off while holding hands, Ralph and Tuuli part ways with us, while Lutz and I head to the temple, going against the flow of people. Today I’m wearing casual clothes so that I can enjoy this watery festival. People appear in small groups from the alleys here and there as they walk towards the gates with their cheerfully sparkling eyes. As everyone assumes that they will get wet, not a single person is wearing fine clothes, despite it being a festival. We press through the opposing waves of people in the central plaza, and then head even further north. Thereupon the pedestrian traffic slowly diminishes. Those who plan to go into the forest right when the gates open have already gathered together near the gates themselves. I had planned to go to the forest to pick up Tau fruit together with everyone, which is why I looked up at Lutz in confusion. Lutz opens his mouth and I can tell by his expression that he is having difficulty finding a good way to say it. Having intended to go into the forest on an excursion together with everyone, I hang my head due to Lutz’ reasonable argument. As usual, I hate myself for becoming nothing more than a burden. While gently patting my head to comfort me, Lutz lowers his voice slightly. The probability that the Head Priest or the Temple Master’s attendants might come to warn me or to check on things is high. If the Temple Master learned that the orphanage was completely vacant, he might not blame only me, but also blame the Head Priest who had given his permission. We arrived at the temple almost the same time as the second bell chimed. It’s now time for the gates to open. Together with Fran, I watch everyone being led off by Lutz. They snuck out through the orphanage’s backdoor, the children holding their hands over their mouths so that they won’t chatter. It can’t be helped – the gatekeeper struggles to keep a straight face when he sees the children, and when the kids see him they can’t help but start giggling. Hopefully this will keep the kids quiet, at least until they are clear of the orphanage. Having seen everybody who left the temple starting to run towards the gate while raising their voices, I go back to my own room while harboring feelings of jealousy. There I change into my blue robe, in order to officially be on duty in the orphanage. Gil and Delia are practising their penmanship while competing to be the first to fill the slates I gave them with a perfect alphabet. Gil seems to be memorizing them slightly faster. I think that’s probably because he has taken karuta to the orphanage to play it with everyone. Leaving the monitoring of the cooks to Delia, who is staying behind voluntarily, I decide to go to the orphanage together with Fran. When we descend to the first floor, I fleetingly glance through the open door at Hugo and Ella, who are cooking with a terrifying vigor to prepare the meals before the fourth bell, when the Tau fruit will be thrown. The Head Priest, who apparently doesn’t tolerate even the slightest compromise in regards to education, seems to have immediately set up an education program for me. Although I have to memorize it before day’s end, there is quite a bit of material to cover. “The Head Priest has assigned this to you after judging how much you will be able to handle based on your calculation and literacy abilities”, Fran says. I feel dejected after seeing the content details written on a wooden tag, but the Head Priest misunderstands. My calculation ability is a gift from my previous life, and my literacy ability is something I strived to achieve because it’s an essential ability for reading. I will be in trouble if he uses that as a basis for the amount of material about the temple’s rituals I can quickly memorize! I’m not actually all that smart. As I was heading towards the orphanage and passing a hallway, I suddenly faced a blue-robed priest, one whose face I have never before seen. Apparently this priest is going to prepare the ritual. The blue-robed priest leaves while snorting and not looking at all amused. I begin to walk towards the orphanage, as well. Fran anxiously frowns and calls out to me while looking worried. Once I entered the orphanage, several gray-robed priestesses had remained in the orphanage. As might be expected of those having been left behind as candidates for flower offering 1, every child is of a different type, but they are all very beautiful children with well-proportioned bodies. Turning around in my direction with a twirl, she bends her head slightly to one side. Her mannerisms are very refined. She looks much more like a proper lady than do I.
I discovered a face I recognised among the grey-robed priestesses. She’s a girl in her mid-teens. She neatly wore her blonde, almost bright orange, hair up. Well, seeing that she’s wearing her hair up, it might be odd to call her a girl since she’s considered a grown woman in this world. However, with her childish looks, it perfectly fits calling her a girl. Wilma’s bright, light brown eyes which are always smiling, narrowed delightfully, making her gentle quality stand out even more. If it’s just preparing the boards and writing the characters, I can manage that well enough, but it seems my illustrations are too different from this place’s culture. So much so that all those around me actually stopped me from drawing. Wilma’s cooperation is indispensable for creating karuta. Wilma’s face brightened up. While being enthusiastic about wanting to draw, she’s also overflowing with love towards the children. Back when we did the major cleanup of the orphanage, certainly Wilma was the very first to run to the children to completely wash them. Shortly after I promised to prepare karuta for the children of the orphanage, the girl next to Wilma cast her eyes down sadly. It seems that Rosina, who had let out a disappointed sigh, was not only mature and beautiful, but also good at playing the lyre. What’s with that? How gracious. I had wanted to hear Rosina play the lyre by all means, but since the instrument was owned by her previous master, you might say that she’s currently in a situation where she has no special skill. If possible, I would like to buy one for her, but even in Japan, instruments were basically pretty expensive. There’s absolutely no doubt that the price for a good instrument would be astronomical. Rosina seems to have previously served with Wilma under the same blue-robed priestess apprentice. It also looks like that priestess apprentice was very interested in the arts, as her attendants were clearly divided into those grey-robed priestesses and apprentices who showed promise in learning the arts, and those grey-robed priests who only did chores. I hear that Rosina and the others polished their skills in singing, musical instruments, dancing, poetry and drawing every day. … Ughh. I was forced to take piano lessons for around three years, but I never touched a lyre. Things like melodicas or recorders don’t exist here, do they? Once Wilma’s group left to prepare the soup, Fran and I ended up being left behind in the orphanage’s mess hall. While I listen to a lecture describing the temple’s ceremonies from Fran, the third bell rings. Soon after, the air becomes filled with the sound of people talking. It appears the brides and grooms have arrived at the temple for the Ritual of the Star Union. I want to go have a look, but there’s no way I can leave. As I am finishing my quota while fidgeting around, the fourth bell chimes. With the Ritual of the Star Union apparently having ended, the noisy commotion gradually fades. Once a little bit of time has passed after silence had returned, the children secretly return through the backdoor. They climb the stairs making sure to keep the sound of their footsteps low as they hold down their mouths. Being told to not talk, I immediately hold my tongue. We hear the sound of the basement’s backdoor closing. Then Lutz comes in and the instant after he lowers his finger from his lips, everyone starts to chatter all at once. Since Lutz is with me, we pass through the basement instead of the hallway. There are a great number of baskets filled with Tau fruit that everyone had gathered. I have Fran carry the Tau fruit, and we return to my room, going through the backdoor. Having already finished preparing lunch, Hugo waited while worrying about what’s happening outside the temple. I have Fran pass two Tau fruit each to both Hugo and Ella. As I turned my back on the kitchen, I sense Hugo running off. Just how much is he looking forward to the Star Festival? And, who does he plan to hit with those Tau fruit? Since Ella raised her voice to stop him with “Wait a minute, Hugo” as if worried about my opinion, I read the mood and head upstairs without turning around. I eat lunch together with Lutz in my own room, while having Delia serve us. Today’s lunch is an imitation of capellini. I had them make it with fresh pasta that was cut as thinly as possible. They experimented by preparing two types; one was garnished with herbs, and used a lightly scented cheese and tomato sauce, similar to a sauce with tomatoes and mozzarella; and the other was vegetable-based oil seasoned with the garlic-like Norilga, herbs, and salt, aiming for a basil sauce. They also prepared a salad garnished with seasonal vegetables and steamed chicken. In reality, I feel an urge to eat chilled soumen 2, but it can’t be helped since I still haven’t seen anything that seems usable in Japanese cuisine. It was inevitable for me to feel jealous after hearing the stories of the orphans happily picking up Tau fruit in the forest and about the people who were arming themselves with their Tau fruit while the orphans were returning to the temple. After the blue-robed priests finish their lunch and once their attendants have finished eating as well, then God’s blessing will be distributed. Since there are also some gray-robed priests working to prepare the carriages, it will take a bit of time until everyone gathers for the throwing of the Tau fruit. 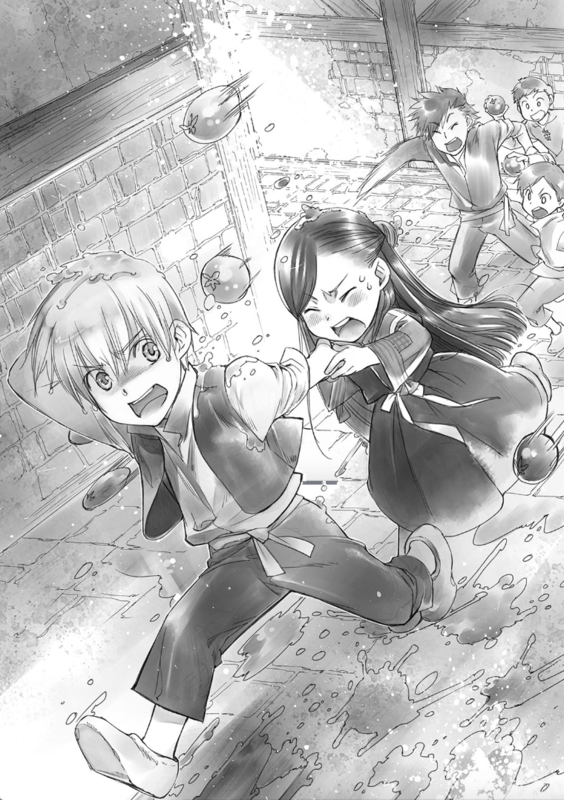 After changing from my blue priestess garb to casual clothes, I rushed out through the temple’s gate together with Lutz. The flooded streets glittered in the summer sun. Close to the temple it’s mostly dry, but as we leave the temple’s vicinity, it becomes wet under our feet. I wonder just how many Tau fruit had to be thrown for the summer sun to not have dried the streets by now? I see children running and shouting out with joy, their whole bodies sopping wet with water dripping from their hair. Tumultuous voices are reverberating from up ahead, the target towards which the giggling children are running. Following Lutz’ advice, I try to secretly peek from within the shadows of a building. It was a large free-for-all battle in an alley that wasn’t very big. There are no allies or enemies here, it’s a battle royale as people are fervently throwing Tau fruit while loudly shouting nonsensical gibberish. As loud yells burst out in the tight space between the buildings, they echo and merge to a near deafening volume. All of them are drenched. Older girls in light summer dresses have clothes clinging tightly to their bodies, so it’s only natural that their figures stand out clearly. In some extreme cases, clothes are completely transparent. There are also many men running around bare chested, as if annoyed by their clingy clothes. … Whoaa, it looks just like the uproar when fans learn their team has won the World Series or the World Cup! All of a sudden Lutz exclaims as water dripped from his head. I turn around in surprise as a few drops of the cold water have hit me as well, and I see several children preparing to fire Tau fruit behind Lutz. The instant the child shouts, the large mob of revelers all turn this way at once. Pierced by the sparkling eyes of hunters who found their prey, I experience a fear that makes me cringe. My entire body shudders after a small scream escaped my lips. I’d be shocked if you expected such smart maneuvering from me. The best I can do, at most, is defending against a direct hit to my face by raising both arms. Despite being stunned, I was running, Lutz leading me by the hand, as he repeatedly smacked down the Tau fruit that came flying our way with his free hand. Just like a real water balloon, the Tau fruit burst once they hit the stone paving. Having evaded any direct hits, I felt relieved, but the mob’s bloodlust was apparently fanned by Lutz’ avoidance. The Tau fruit that are coming flying one after another hit me and burst open with splashing sounds. The sensation of being hit itself feels bouncy and it doesn’t hurt much even if I’m directly hit. But I’m getting goosebumps from the water that burst from the fruit which hit my back, and from the water dripping down from my head and down my spine. What Lutz was able to ward off was only the first wave. Since adult have joined in as well, there’s no way we will be able to escape. In the blink of an eye we have been completely surrounded and overrun. Unable to avoid or escape, we suffer a concentrated barrage from the crowd, a crowd that has become drunk in its enthusiasm for the festival. We are completely soaked in an instant. While laughing heartily and praising Lutz for trying to protect me to the bitter end, they fled as quickly as they’d come, looking for more victims. With my fingertips I gently pick up my skirt which is dripping wet as Lutz agrees, sending water drops flying with a shake of his head. Once I firmly wring out my hair, water trickles down making dripping sounds. While wringing out our clothes and hair, Lutz and I return to the temple. Seeming to put more emphasis on the dinner party afterwards, than on throwing Tau fruit at each other in the northern area, some people had started preparations at the plaza’s water wells located here and there. Others were setting up impromptu tables by laying boards across wooden boxes, as dishes are brought in from houses all around. I’m sure even the partiers causing an uproar throwing Tau fruit, will remember how hungry they are once the food starts being given out. Before getting scolded by mother, we were yelled at by Delia. While I was agreeing with a slight nod to Lutz’ murmuring of “Hey, isn’t she more scary than Aunt Elfa?,” Fran, who had changed into his casual forest clothing (in case he got wet) showed up. Looking at the two of us who are sopping wet, he rubs his temples as if distressed. Because Delia said that she can’t do something so common as throwing Tau fruit, she decides to stay back. It seems that Gil had already gone to the orphanage a long time ago. By the time we returned to the orphanage through the backdoor way, everyone had already changed from their priestly clothes into old clothes, and had taken the Tau fruit, which had been stored in the basement outside. Upon Lutz’ instruction to split them into two teams, Fran appropriately divides everyone, taking into consideration the ages and number of men and women so as to turn it into an even throwing match. We designate an area where it’s fine for them to run around, and made them promise not to go outside the area’s boundary. Lutz doesn’t move, he merely looks towards the several baskets. At such times I, who have the highest social standing, have to move first. Even though the Tau fruit I had seen in the forest in the spring was just about the size of the first knuckle joint of the thumb, the fruits inside the baskets now were larger than my fist. As they seem to be engorged with water, they felt like jelly. Because I had closed my eyes for the most part when I was hit by so many of them, that might be the first time that I’m carefully examining a Tau fruit. The instant I pick up the first fruit, I feel mana being absorbed just like at the time of offering. At the same time the Tau fruit started to change its appearance, while bubbling unevenly. Inside the Tau fruit that previously had a translucent red color just like a water balloon, hard-looking seeds similar to a pomegranate, start to increasingly appear one after the other. As I’m moving about in confusion holding this in my hand, the fruit’s pale red color is slowly deepening. The inside of the fruit is now filled more with seeds than with water. Its skin, which used to be flabby, becomes hard and so dark that the inside can’t be seen anymore. Now that it has changed so much, I finally realize there’s no doubt that this red fruit is a seed of Tronbay which I have seen before! Once I say that while still holding the Tau fruit, Lutz, who had watched the Tau fruit changing its shape, immediately rushes off to the basement that’s used for storage. He hurls orders to the orphans while dragging out a basket with edged tools that seem to be knives and hatchets. At the same time as the orphans rush to the knives, the skin of Tau fruit becomes more firm and starts getting hotter. Previously, when I threw one hot like this, the Tronbay’s fast-growth took place. Gil, who smartly wields a hatchet-like tool, stands beside me like some anime hero 3 ready to protect me with his life. Lutz holds a knife in one hand and points at a spot with no stone paving where grass grows thickly. While listening to Gil’s and Lutz’ voices, I turn to where I can see the soil, and throw the Tau fruit with all my strength.